The second game in the 48th Oza title match was played in Hyogo Prefecture on 22 November. Taking white, O Rissei Kisei, the defending Oza, defeated Cho Chikun by half a point. That means that the best-of-five title match is even at one win each. The third game is scheduled for 30 November. At the age of 26, Inori Yoko 5-dan has won her first title, the 19th Women's Honinbo. She did this by beating the defending champion, Chinen Kaori (also aged 26) in the fifth and final game of the title match. Playing black, she forced Chinen to resignaiton after 179 moves and took the title with a 3-2 score. The game was played in Tokyo. The best-of-five title match to decide the winner of the 5th Samsung Cup has got under way. The first game was played in Korea on 23 November. Taking white, Yoo Chang-hyuk 9-dan of Korea forced Yamada Kimio 8-dan of Japan to resignaiton after 186 moves. The remaining games will be played in Korea in mid-December. If the match goes the full distance, games are scheduled for the 11th, 12th, 14th and 15th. The players are vying for a first prize of 200 million won. The 41st Okan (Crown) title game was held in Nagoya on 20 November. Unusually for a title with a challenger system, the title is decided by just one game. This pitted last year's winner, Hane Naoki 8-dan, against Yamashiro Hiroshi 9-dan. Playing black, Yamashiro forced Hane to resignaiton after 213 moves. The first prize is one million yen. Ma Xiaochun 9-dan won the fifth and final game of the 8th Mingren title, China's equivalent to Japan's Meijin title. Playing white, Ma defeated the challenger Shao Weigang 9-dan by half a point and so retained his title with a 3-2 score. The game was played on 21 November. Game 1 (27 October). Ma (B) won by 1.5 points. Game 2 (29 October). Shao (B) by resignation. Game 3 (7 November). Ma (B) by resignation. Game 4 (20 November). Shao (B) by 3.5 points. Game 5 (21 November). Ma (W) by half a point. It look as if Ma may be regaining form after a prolonged slump. The 11th International Amateur Pair Go Championship was held on Saturday and Sunday, 18 and 19 November, at the Hotel Metropolitan in Ikebukuro, Tokyo. The tournament was a great success, establishing yet another record for a pair-go event. Like last year, there were 22 countries and territories participating in the Main Tournament, which decides the world's top pair-go team, but five of these were making their debut in the tournament. They were Vietnam, Croatia, Bosnia & Herzegovina, Cuba, and Colombia. The 21 overseas teams were joined by the 11 teams that had won their way through the regional qualifying tournaments in Japan. Since there were also 220 teams playing in the A, B and C blocks of the Araki Handicap Tournament, which is held on the Sunday parallel to the Main tournament, that made a total of over 500 players, a new record for pair go in Japan. In the Main Tournament, the DPR Korea scored its first ever success in an international tournament, with its team of teenagers Ms. Kwon Mi-hyon and Rim Hyon-chol taking first place with a 5-0 score. In the final round, they defeated the Korean team of Bae Yun-jin and Lim Dong-kyun to wrap up the championship. Taking second place was the husband-and-wife team of Hiraoka Yuriko and Satoshi (the latter is a former WAGC champion), which lost to Korea in the second round and finished on 4-1. 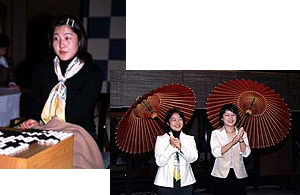 Also finishing on 4-1 were: Sato Momoyo and Shimohashi Koichi of Hokkaido, who came third; the Korean team mentioned above, which took fourth place; the Chinese Taipei team of Chen Ching-chin and Yu Cheng-juei, in 5th place; and last year's winners, Goto Naoko (wife of Goto Shungo 9-dan) and Taga Bungo, who came 6th this time. The Goto-Taga team was put out of the running for the top place in the first round, when they lost to the Hiraoka team. Last week was not a good week for the Western members of the Nihon Ki-in. Michael Redmond had no game (he was in action at the weekend, however, as one of referees at the pair-go championship), but Catalin Taranu 4-dan and Hans Pietsch 4-dan both lost their games. The former lost by resignation to Tsuruyama Atsushi 3-dan (B) in the 26th Kisei preliminary tournament. Catalin lost, also by resignation, to Yamashiro Hiroshi 9-dan in the 2nd preliminary section of the 40th Judan tournament. We have the exact details of one of the games in the LG Cup quarterfinals held in Paris on 14 November. In his game with Cho Hun-hyun, O Rissei held black and won by 16.5 points. Unfortunately, we do not have more details for the other games. This is a prize instituted by the producers of go programs on TV to honour players who have made a significant contribution to their programs. On 16 November, the 18th Prize was awarded, and, for the first time it was shared: between O Meien and Michael Redmond. Apparently the group of producers wanted to round off the 20th century by honouring overseas players who have made their home in Japan. In the go field, both have scored significant achievements recently, O Meien winning the Honinbo title and Michael Redmond earning promotion to 9-dan, but the concern of the producers was more with their activity as TV commentators. Michael was praised for his lucid commentaries, delivered in beautiful Japanese, that make top-level professional go accessible to kyu players (he has been a regular commentator for a couple of years on the lengthy satellite-TV programs that provide live coverage of top title-match games). Ryu Shikun's chances of regaining the Tengen title are now looking very good. In the second game of the 26th title match, played at Awara Hot Spring in Fukui Prefecture on 16 November, Ryu, playing white, defeated the title holder by half a point after 256 moves, the same margin as in the first game. Ryu now needs just one more win to take the title. For Kobayashi, this must be reviving ominous memories of the 1995 Meijin title match, in which he also lost the first two games by half a point (to Takemiya). Although he managed to pick up one win, he surrendered the title. Will he be able to do better this time? The third game is scheduled to be played on 30 November. If the title match goes the distance, the fourth and fifth games will be played on 6 and 21 December. The Taiwanese-born O Rissei, current holder of the Kisei title, was the only Japanese representative left in the 5th LG Cup. In the quarterfinals, held in Paris on 14 November (the first time that one of these international championships has gone outside the Far East), O Rissei defeated Korea's Cho Hun-hyun 9-dan and so earned a place in the semifinals. This ended Cho's good run in international go this year -- he had already won the TV Asia Cup and the Fujitsu Cup. In other noteworthy results, Lee Chang-ho extended his almost complete mastery over China's number one and the world's top woman player was eliminated by one of Korea's new young stars. Details of the other results: Lee Chang-ho 9-dan (Korea) beat Ma Xiaochun 9-dan (China), Lee Se-dol 3-dan (Korea) beat Rui Naiwei 9-dan (Korea), Zhou Heyang 8-dan (China) beat Seo Bong-soo 9-dan (Korea). These results mean that the LG Cup falls in line with what O Meien often says is the norm for international tournaments: one player each from Japan, China, and Korea plus Lee Chang-ho. Semifinal pairings: Zhou vs. Lee Se-dol, Lee Chang-ho vs. O Rissei. The fourth game of the 25th Women's Honinbo title match was played in Osaka on 15 November. Playing black, Chinen Kaori defeated Inori Yoko by 4.5 points. That tied the score at 2-all, so Chinen still has a chance of defending her title. The final game will be played at the Nihon Ki-in in Tokyo on 22 November. Three games were played in the 56th Honinbo league on 16 November, thus completing the second round. There are three Chos in the league and two of them, Cho Sonjin 9-dan and Cho U 6-dan, share the lead on 2-0. The results: Cho Chikun 9-dan (B)(1-1) defeated Otake Hideo 9-dan (1-1)by resignation; Cho Sonjin 9-dan (B)(2-0) defeated Yamada Kimio 8-dan (0-2)by resignation; Hane Naoki 8-dan (W)(1-1) defeated Yuki Satoshi 9-dan (1-1)by resignation. Cho U 6-dan is 2-0 and Oya Koichi 8-dan is 0-2. Kobayashi Koichi Judan defeated O Rissei Kisei in a semifinal of the 23rd Kakusei tournament held on 2 November. Playing black, Kobayashi won by 4.5 points. In the other semifinal, Kato Masao will play the winner of a game between Yoda Norimoto and Cho Sonjin. O Rissei became the first player to reach the final of the Losers' Section of the 39th Judan tournament when he defeated Hane Naoki 8-dan in a game played on 9 November. Taking black, O won by 3.5 points. His opponent in the final will be the winner of a game between O Meien Honinbo and Takemiya Masaki. The winner of the final will meet Yoda Norimoto in a play-off to decide the challenger. This is a minor tournament as far as prize money goes, with a first prize of just 300,000 yen, but it has the advantage for participants that they can play on their home computers at the weekend. The time allowance is one minute, followed by Canadian Overtime of 25 moves every five minutes. 24 professionals participated, but anonymously, under their online IDs. The final was won by Kobayashi Koichi, who defeated his disciple Kono Rin 5-dan. 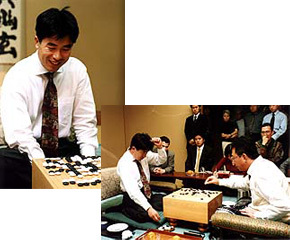 In theory, players shouldn't know who they are playing, but at one of Kobayashi's study sessions Kono happened to mention that he had reached the final. Other prominent players such as O Rissei and Michael Redmond also took part, but the only way of finding out how they did is to ask them personally -- which we don't plan to do. This is a Korean-sponsored tournament for amateur players from eight Asian countries and consists of team and individual championships. The second championship was held in Seoul from 16 to 20 October. Countries participating were Korea, Japan, Chinese Taipei, Chinese Hong Kong, Vietnam, Singapore, Thailand, and Russia. This was a big increase over the three (Japan, Korea, and Russia) that took part last year. Last year the team tournament was won by Japan. This year the teams were reduced from five to three players. This year the key match came in the second round, with Korea beating Japan 2-1. The final places were: 1st, Korea; 2nd, Japan; 3rd, Chinese Taipei. The individual championship was won by Hiraoka Satoshi of Japan, a former WAGC champion. His opponent in the final was Alexander Dinerchtein of Russia, who had defeated Mukojima of Japan in the semifinal. Alexander has been studying as an insei in Korea for the last three years; his second place in this tournament shows that he must be getting very close to professional level. Below is an update on games played so far in November by Western members of the Nihon Ki-in. Catalin Taranu 4-dan: On the 1st, playing black, defeated Hotta Seiji 4-dan by resignation in the 1st preliminary round, 27th Meijin tournament. On the 8th, lost to Baba Shigeru 9-dan by 1.5 points in the 2nd preliminary round, Okan (Crown) tournament. Hans Pietsch 4-dan: On the 1st, playing black, lost by resignation to Takano Hideki 4-dan in the Oteai. On the 8th, playing black, beat Takemiya Yoko 3-dan by resignation in the 1st preliminary round, 27th Meijin tournament. Four players have recently won their spurs as professionals, though they won't actually make their debuts until April next year. In Tokyo, a Professional Qualifying tournament was held that lasted three months. The reason: it was an all-play-all league with 27 members. The time allowance was three hours per player, so each game took a whole day. The top three place-getters qualified as professional shodan. They were: Ueda Takashi (aged 26) and Yamada Shinji (aged 17), who both scored 22-4, and Takekiyo Isamu (aged 21), who scored 21-5. There are two points of interest. First is the average age: 21, which is unusually high. The second is that all three are native-born Japanese; usually, at least one of the places is taken by one of the Taiwanese or Korean inseis studying at the Nihon Ki-in. These three were joined by the winner of a tournament for hopefuls in Osaka and Nagoya. The rule for Western Japan is to alternate between one new professional each from the Osaka and Nagoya branches of the Nihon Ki-in in odd years and just one from the two combined in even years. Just four players, the top two inseis at each branch, participated in this year's tournament, in which the players all played each other twice. The winner was Kawada Kohei, who won all his games. Kawada is 20; he was formerly an insei at Nagoya and in the past had missed four good chances to make shodan, besides having to take time off because of illness. A tournament for female inseis to select one more professional got under way on 31 October. Ryu Shikun 7-dan has made a good start in his quest to regain the Tengen title that he held for three years in a row in the mid-90s. The first game in the 26th Tengen best-of-five title match was played in Asahikawa in Hokkaido, the hometown of the title holder, Kobayashi Koichi, on 9 November, but being the 'home side' makes little difference in go. Playing black, Ryu made slightly the better start, and, although the game got very close, ended up the victor by just half a point. The game finished at 6:27 pm after 231 moves. Ryu would now appear to have an excellent chance of winning back this title. In past encounters, he has a slight edge over Kobayashi, with the record now being 11-8 in his favour. Also, Kobayashi seems to be in a slump -- at the end of September, his record for the year was 16-18, probably the first time in his career it has been a minus one so late in the year. In contrast, Ryu is enjoying excellent form, with a 30-19 record. The second game is scheduled for 16 November. The first game in the second round of the 56th Honinbo league was played on 9 November. Cho U 6-dan (W) defeated Oya Koichi 8-dan by resignation. This gave Cho his second win, so, at least for the time being, he is the sole leader in the league. Oya, who is undergoing a tough initiation into league play, suffered his second loss. The third vacant seat in the 26th Meijin league was won by Cho Sonjin 9-dan, who seems to be enjoying great form this autumn. In a game played on 9 November, just one week after he became the Kisei challenger, Cho (W) defeated Takao Shinji 7-dan by resignation and so will make his debut in the Meijin league. This completes a triple for Cho, as he is also a member of the Honinbo and Kisei leagues. The play-off to decide the challenger to O Rissei for the 25th Kisei title was held at the Nihon Ki-in on 2 November. Playing black, Cho Sonjin 9-dan defeated Awaji Shuzo 9-dan by resignation after 239 moves. This will be Cho's third best-of-seven title match. He won the Honinbo title from Cho Chikun last year but lost it to O Meien this year. This will be yet another title match featuring overseas members of the Nihon Ki-in. The first game of the best-of-seven title match will be played in Taipei on 12 & 13 January 2001. To date, Cho and O have played only eight games and the honours are evenly shared. Lee Chang-ho has taken a commanding lead in the 4th Ing Cup and now needs just one more win to take this title, the only important international titles he hasn't already won. In the first game (1 November), Lee defeated Chang Hao by seven points. In the second (3 November), he won by just 1 point. The above games were played in Chengdu, The remaining games will be played in Shanghai on 3, 5 and 7 December (if the match goes the full distance). Chang Hao seems to have a complex about Lee Chang-ho (actually, in general, Chinese players do even worse against Korean players than Japanese do, which helps explain why they have won only four international titles, to Korea's 24 and Japan's 17). Chang's record against Lee is now 1-13. Rin Kaiho 9-dan already holds the record for most appearances in the Meijin league at 35 (including terms as title holder), but he is now assured of extending that record. 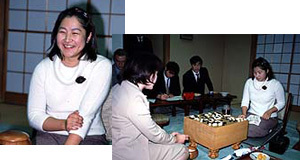 In a play-off held at the Nihon Ki-in on 2 November, Rin (W) defeated Yamashiro Hiroshi 9-dan by resignation to make a comeback in the 26th league. Komatsu Hideki 9-dan has already won a place, so that leaves just one to be decided. It will go to the winner of a game between Takao Shinji and Cho Sonjin. Yoda Norimoto's good form is continuing. In the final game in the Winner's section of the 38th Judan tournament, the new Meijin (B) defeated Takemiya Masaki 9-dan by 5.5 points.. Yoda will meet the winner of the Losers' section in a play-off to decide the challenger to Kobayashi Koichi Judan. In a welcome bit of news for Japanese go fans, Yamada Kimio 8-dan has reached the final of the 5th Samsung Cup. However, he will be facing a formidable opponent in the best-of-five, Yoo Chang-hyuk 9-dan of Korea, a past winner of the Fujitsu and Ing cups. In the semifinals, held in Korea on 26 October, Yamada (W) defeated Korea's Seo Bong-soo 9-dan by 1.5 points and Yoo (B) defeated his fellow countryman Yang Jae-ho 9-dan by resignation. This is Yamada's best performance yet in an international title. His best previous effort was reaching the semifinals of the 4th Samsung Cup. Cho Chikun, who has just lost his Meijin title, has made a good start in his challenge for the 48th Oza title. In the first game, played in Kanagawa Prefecture on 23 October, he defeated O Rissei by resignation. Cho had white. O is, of course, the player who took the Kisei title from Cho, so the latter will be hoping to take revenge. For the first time in 12 years, Cho has no title to his name, so he is a simple 9-dan. He may be able to rectify that quite soon. The third game of the 19th Women's Honinbo title match was played in Tokyo on 25 October. The title holder is Chinen Kaori, who has held this title for three years in a row. The challenger, making her debut in a title match, is Inori Yoko 5-dan. The title match started with Inori winning the first game, but Chinen tied the score in the second. The match is continuing to seesaw: Inori (B) won the third game by 7.5 points. She now needs just one more win to take her first title. Komatsu Hideki has made a comeback to top-level play by winning a place in the 26th Meijin league. He did this by beating the top young player Cho U 6-dan in a game played on 26 October. 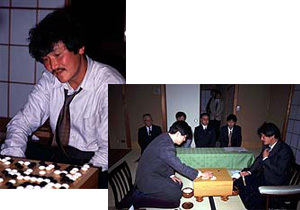 Komatsu had black and won by 1.5 points. Komatsu has played in the Meijin league once previously (the 17th league) and in six Honinbo leagues (46th to 50th and the 52nd). On the same day, the new Gosei, Yamashita Keigo, suffered a setback when he lost to Takao Shinji 7-dan in the same Meijin preliminary round. Takao had black and forced Yamashita to resignaiton. Takao will now meet Cho Sonjin in the play-off for a league place. The third vacant seat will go to the winner of a game between Rin Kaiho and Yamashiro Hiroshi. After three and a half years as a professional, Hans Pietsch of Germany has won promotion to 4-dan, so he is moving up the dan ladder at quite a good rate. Hans earned his promotion on 27 September when, playing white, he defeated Ko Reibun 2-dan by five points. This was exactly one month after Michael Redmond earned promotion to 9-dan. Hans draws level with the other European player at the Nihon Ki-in, Catalin Taranu 4-dan of Romania, who is a member of the Nagoya branch. Western players active at the Nihon Ki-in are definitely making their presence felt. Last week Mitsunaga Junzo 2-dan, a former university champion, won promoted to 3-dan on the same day Hans Pietsch earned his promotion. In a one-time experiment, five amateurs participated in this year's Meijin tournament. Two of the five got through the first round. However, one of them, Nakazono Seizo, was eliminated in the second round when he lost a game to Rin Kanketsu 2-dan on 25 October. Rin had white and won by half a point. That leaves only Kikuchi Yasuro to carry the flag for the amateurs. Two games were played in the Losers' section of the 38th Judan tournament on 26 October. In one of them, O Rissei Kisei (W) defeated Ogaki Yusaku 8-dan by resignation. In the other, Hane Naoki 8-dan defeated Rin Kaiho 9-dan. As a result, four players survive in the Losers' section: the above two, who are drawn to play each other, and O Meien Honinbo and Yamashita Keigo, who will also be matched. In the Winners' section, Takemiya Masaki 9-dan and Yoda Norimoto Meijin will meet in the final (the loser will switch to the Losers' section). One of these six players will be next year's Judan challenger.